This morning, I finally finished the third and final part of the futuristic role-playing Xenosaga video game series. The series' story-line is massive, epic and, to be honest, rather too complex for its own good. Don't get me wrong, I very much enjoyed playing the series. It looks great, it's got a huge amount of (mostly) fun side quests, the characters are likeable (if a little melodramatic). However, the story is so deeply steeped in mythology, Biblical scholarship and the works of Nietzsche (yes, that Nietzsche), it's often difficult to figure out exactly what the hell is going on or what the characters are going on about. Although I enjoyed it, I won't be going back to play these over again. Guess I'll turn in the volumes I own for credit at EB Games. The bizarre twist? 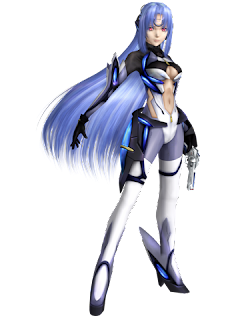 It turns out that KOS-MOS was built to be the re-incarnation of... Mary Magdalene. Mary. Magdalene. Whahey?! Posted by Doug A Scott at 2:50 p.m.